Knowledge : Hanhaba-Obi - KIDORAKU Japan - What a Kimonoful World! Hanhaba-Obi is a casual Obi. It's worn by women with a casual Kimono, mainly Yukata. But if it has gorgeous design, you can wear it with some semi-formal kimono. It's 15-18cm in width, and 340-360cm in length. Having around 400-450cm in length is called "Cho-jyaku". You can enjoy unusual way to tie obi with Cho-jyaku Obi. "Hanhaba-Obi" is the generic name for half width Obi. "Han" means "half", and "Haba" means "width". It has half-width of usual Fukuro-Obi (around 30cm). Hoso-Obi is the generic name of an Obi that have thin-width than Fukuro-Obi. Width is not only 15-18cm, there are various width. To tell the truth, Hanhaba-Obi is a kind of Hoso-Obi. But now, the name of Hanhaba-Obi is more famous than Hoso-Obi. 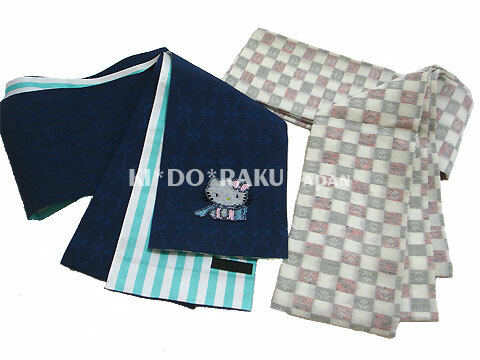 Generally, Hanhaba-Obi that is sold with Yukata is called "Yukata Obi". It's often made from polyester and cheap. It's very easy to get in summer. And, having the lining is called "Ko Fukuro-Obi" or "Yon-sun Obi". "Koshita Obi" is a little different from Hanhaba-Obi. It's 12-13cm in width, and length is shorter than Hanhaba-Obi too. and "Shita" mans "under". So, it's worn with only Hakama. Putting kimono on, tying Koshita Obi, and wearing Hakama. because Koshita Obi can't use without Hakama. Buying Koshita Obi is uneconomical.